Scientific research cannot exist in isolation from society. This is certainly true of renewable energy research where (at least in Australia) the imperative for environmental sustainability is frustrated by short-term economic and political demands. Off Grid responds to these issues. 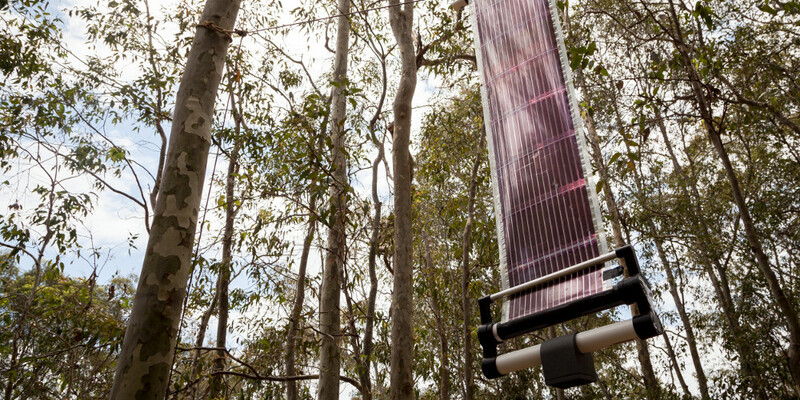 Researchers at the University of Newcastle are developing groundbreaking organic solar cell material that is low-cost, water-based, and printed with off-the-shelf technology on flexible film. Off Grid incorporates this film in the construction of three microprocessor controlled motorized blinds that are suspended in the trees in a local bushland setting. Each device acts autonomously and is powered by available sunlight, raising and lowering its blind to maintain its charge and taking no more sunlight than it needs. The reflective surface of the solar blinds mirrors the surroundings while recorded bird calls signal their presence and evoke the peaceful ambience of a natural environment — hinting that the devices belong there. Recorded statements on renewable energy and climate change from political leaders past and present break the peace when the blinds are lowered or raised. Andrew Styan (AU), born in 1958, is a visual artist and researcher developing approaches for building ‘common ground’ in an increasingly polarized world — creating a space for the conversations and ideas needed to address our common social and ecological crises. Building on a former career as an industrial metallurgist, his practice uses coding, data visualization, interactivity, and mechatronics to create objects, videos, and installations that often reference natural processes and scientific principles. His research explores how this practice can be applied beyond traditional art environments.